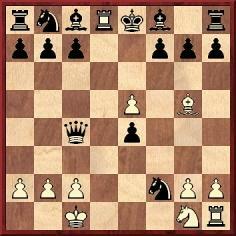 8 Bc4 Qxc4 and White forced mate in three with 9 Qd8+ Kxd8 10 Bg5+ Ke8 11 Rd8 mate. 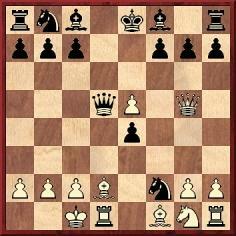 Source: American Chess Review, July 1886, page 9. ‘Probably the most famous of all miniature games’, wrote Irving Chernev (1000 Best Short Games of Chess, page 18) about Réti v Tartakower, Vienna, 1910. The description is debatable, not least because on page 213 Chernev quoted favourably Marshall’s statement that Morphy’s opera brilliancy was ‘the most famous game of all time’. Although the Réti game has lost much of its impact because of the various anticipations of the queen sacrifice, we wonder about the circumstances in which it was played, particularly since it is hard to find in magazines of the time. It was, though, published on page 4 of Schachjahrbuch für 1910. II. 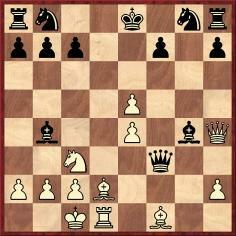 Teil by L. Bachmann (Ansbach, 1911), with the finish 10 Bg5+ Resigns. When Tartakower gave the score on pages 81-82 of A Breviary of Chess (calling 11 Bd8 ‘a splendid mate’ and declaring that ‘nothing could better illustrate the power of a double check’), he merely put ‘Played in Vienna, 1910’. On page 17 of his earlier book Schachmethodik (Berlin, 1928 and 1929) Tartakower called it a ‘Freipartie’, i.e. a casual game. The term ‘lightning game’ was used on page 23 of The Chess Player’s Bedside Book by R. Bott and S. Morrison (London, 1966), but on what grounds? The four games listed by Richard Forster in Heroic Tales were Maczuski v Kolisch, Paris, 1864; Prince Dadian v N.N., Odessa, 1894; Distl v Roszypal, Prague, 1900; Kaldegg v Zeissl, Vienna, 1903. Latest update: 27 February 2012.